Fanorona, the traditional Madagascan board game played with black & white pieces, consists of lines & intersections, creating a grid with 5 rows & 9 columns. 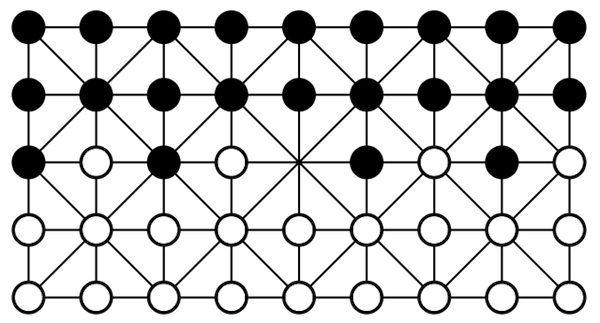 A line represents the path along which a stone can move. They meet at weak & strong intersections. At a weak intersection, a stone may only move horizontally & vertically, while at a strong intersection it’s also possible to move diagonally. The objective: capture all the opponent’s pieces. 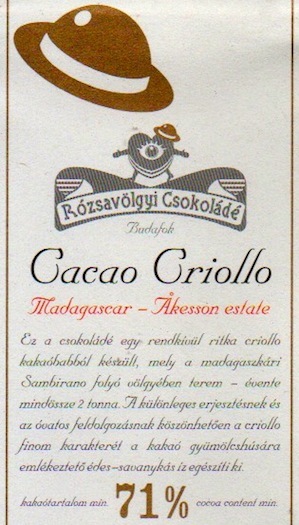 Cacao Criollo by Rózsavölgyi… a captivating chocolate board with its own black & white pieces. it takes down all opposing taste-buds with crisscrossing dexterity. cotton, slippery elm & hibiscus... unappetizing? The 4th bar now -- Bonnat, Åkesson/Pralus, & Domori's triumphal Madagared the other 3 -- from a specific stand of trees in Sambirano Valley. So named here "Bertil's babies" after proud papa Bertil Åkesson, the main purveyor of Madagascan cacáo to boutique barsmiths around the world. He classifies them as Criollo. Yes, Madagascar hosts some verified Criollo in its broad genetic mix. These particular trees of Åkesson have yet to be genetically tested however. Maybe Bertil's just 2 damn bizzy 2B bothered. Whether they actually belong to the Criollo family or form some cocoa myth-information campaign awaits DNA analysis. Let's hope this happens with the Heirloom Cacao Preservation Initiative whose mission protects, propagates & promotes those rare Theobroma cacao trees endowed with special value — historic, cultural, botanical, geographical & moreover organoleptic (flavor). In short, the diamonds of cacáo. In the meanwhile, taste will have to do. DNA or no DNA, flavor is always the final arbiter. Rózsavölgyi nurtues these babes tenderly / lovingly. Moderate roast & methodical refining lets them sing out so cravers will cry out for 'more'. Only quibble to the nibble: tough beginning in the Texture & subsurface depth never really plunges to the lower fathoms. Perhaps just as well for that might have built up so much pressure on taste-buds & against skull bones to explode heads off. Ah huh, pressure can bust pipes or create diamonds.